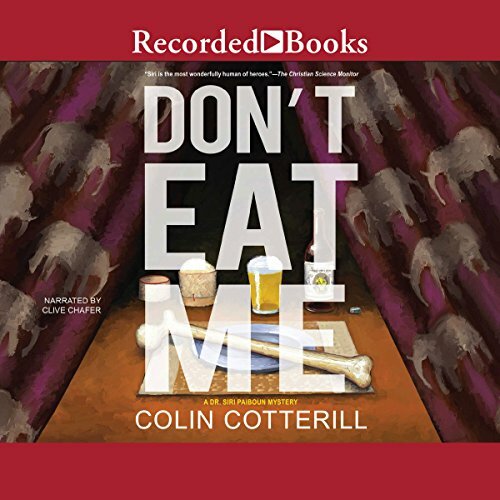 Between getting into a tangle with a corrupt local judge and discovering a disturbing black-market business, Dr. Siri and his friend Inspector Phosy have their hands full in the 13th installment of Colin Cotterill's quirky, critically acclaimed series. Dr. Siri Paiboun, the ex-national coroner of Laos, may have more experience dissecting bodies than making art, but when he manages to smuggle a fancy movie camera into the country he devises a plan to shoot a Lao adaptation of War and Peace with his friend Civilai. The only problem? The Ministry of Culture must approve the script before they can get rolling. That and they can't figure out how to turn on the camera. Meanwhile, the skeleton of a woman has appeared under the Anusawari Arch in the middle of the night. Siri puts his directorial debut on hold and assists his friend, the newly promoted Senior Police Inspector Phosy Vongvichai, with the ensuing investigation. Though the death of the unknown woman seems to be recent, the flesh on her corpse has been picked off in places as if something - or someone - has been gnawing on the bones. The plot Phosy soon uncovers involves much more than single set of skeletal remains. Another fascinating tale and morality lesson with Dr Siri Paiboun to take us out of our comfort zone into things we'd rather hide from. You'll find that a particularly horrible pun when you read about the disgusting aspects of trafficking animals and humans, especially as these activities have grave impact on the murders. Of course there is a secondary plot, but no spoilers here. There does continue to be lots of humor just as we've come to expect, and it softens the awful stuff without diminishing truth. I need audio, and Clive Chafer continues to give a masterful performance. I’m impressed with this cozy mystery series. It’s well written and includes timeless ideals about everything that makes us human. I’ve been lucky enough to purchase all of this series and I’m always happy to recommend these tomes to people that enjoy reading wonderful books. The Laos detectives are faced with the biggest danger yet: absolutely legal cruelty. how will they react to a half eaten skeleton? a blackmailed confidant and an economy based on cruelty and suffering? The story has it's bleak moments but it's such a good payoff in the end the bleakness is forgotten.